Look at this. 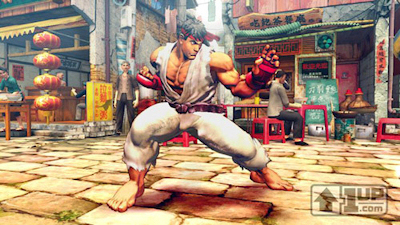 It is a screenshot (From 1UP)of Street Fighter IV, in-engine. I was puzzled at first, but after reading some of the associated info, I am cautiously optimistic. 3-D visuals and a strictly 2-D fighting engine? Sounds good so far. I just need to see this game animate in the form of a combo video of some sort. If Street Fighter IV is too much for you to handle, how about some of the changes for Super Street Fighter 2: Turbo HD Remix’ Balance Mode? A couple of days ago, David Sirlin updated the blog over at Capcom Unity concerning the changes they are making to Ken Masters. His Hurricane Kicks and Dragon Punches will be improved; very nice. No release dates have been pegged for either Street Fighters as of yet.